Now, I don’t know of anyone who disagrees descendents differ somewhat from their ancestors. Change happens, and if you want to call that “evolution”, fine (I prefer “adaptation”, or “change”) but why not be more specific, as the article linked above describes? Why not just focus on the various mechanisms of inheritance, without reference to evolution? Think about it. 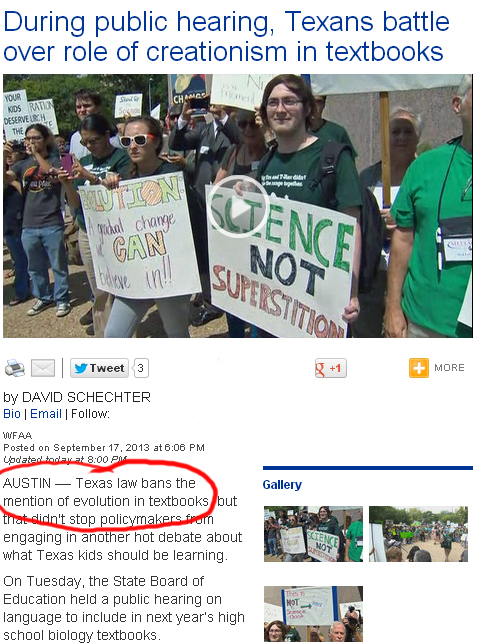 The “banning evolution” story by WFAA news in Dallas was published last night, and broadcast over the evening news, and nobody caught the typo! They have since discovered the blunder, and the text was edited and video taken down this morning. But how does a major news station in a major United States city miss something so obvious? Yesterday (Sep. 17, 2013), the Texas State Board of Education heard public testimony regarding new textbooks up for adoption. Review panels are selected by board members to supposedly check for factual errors and ensure that the books are meeting state standards. Because one or two reviewers suggested teaching “creation science”, the anti-creationists went ballistic. 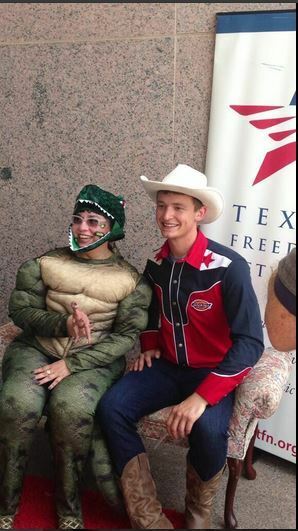 Armed with plenty of adjectives, the ideologically driven Texas Freedom Network staged a protest. Similar to the dinosaur history protest in front of a recent Texas homeschool convention, they even brought some of the same adjective-filled signs! For several hours, the board heard from over 50 testifiers, the majority of which parroted the same thing: keep creationism out of textbooks. From concerned parents to Univ. of Texas professors to the ACLU, over and over the board heard ideological comments laced with adjectives. If you wanted proof of the claims made in the WSJ article mentioned earlier, this was the place to be. It was a sea of anti-intellectualism, complete with people running around in dinosaur costumes! But a few of us did show up to encourage intellectual exploration and encourage the board to approve textbooks that give students the best 21st Century Science education they could get. In my public testimony, which you can download here, I encouraged board members to reject textbooks unless they revised them to include the subject of epigenetics. I gave them all a copy of the Mysterious Epigenome, signed by the author. I also gave them a course map for the next biology standards revision. My course map included 4 big ideas, and was based off a course map for the University of Texas’ introductory biology course. I added an idea on “mechanisms of inheritance”, that does not mention evolution, but instead focuses on testable, repeatable science surrounding the various mechanisms for inheriting biological information. In a 21st Century biology course, you might as well not even teach it if you aren’t going to include a discussion of epigenetics. But what is epigenetics? Well, just think of your DNA (which each cell has an identical copy of) as the “ship”. A ship stays in port unless it has a captain to direct it. The “captain” is the epigenome, a set of information that switches the DNA on and off at different times and locations. Think about this, how did you go from a single cell to a human body with over 200 different cell types, all with the same DNA? The answer? Epigenetics! Or how did scientists recently produce hundreds of different varieties of plants in just a few years, all with the same DNA? Epigenetics! Biologists with an ideological torch to wave are “nervous” about epigenetics, because it causes changes without a change in DNA, the “sacred cow” of evolutionism. Real scientists however, find it absurd to be “nervous” about epigenetics, and are pushing us farther and farther into this amazing field. In my own courses, my students are learning about epigenetics, as well as other 21st Century biology topics. My products are primarily for home-educated students, but private and public schools are certainly welcome to use them. But what will happen to public school students who are given a textbook filled with 19th and 20th Century biology concepts, many of which are just untested speculation? How far behind will these students be when they get to college and career? The answer? Compared to my students and those in other countries that focus on science instead of ideology, American public school students will be way behind. And one of the main reasons they will be behind is anti-creationist ideologues who oppose anything a creationist mentions, even if it has to do with getting 21st Century Science into textbooks. Prior to TFN’s dinosaur costume party, I met up with Ron Wetherington, an anti-creationist activist and anthropology professor at SMU. Being a natural history researcher, I did not expect him to know much about epigenetics, but I asked him what he thought about getting it into textbooks. He didn’t think it was a good idea. When I tried to keep the discussion going, he was not able to give a reasonable answer and politely excused himself from the conversation. Next, University of Texas molecular biologist Dr. Arturo De Lozanne spoke during the protest, proclaiming students deserve the best science education based on the latest research. Afterwards, I spoke with him about getting the latest research, which would include epigenetics, into textbooks. I told him I was a creationist, which immediately stoked the anti-intellectual fires in this otherwise intelligent man. Amazingly, Dr. Lozanne was not in favor of teaching something as fundamental as epigenetics to high school students! But minutes before he said he was for teaching the latest research. This irrational response could only be because, to agree with me would mean that he agreed with a creationist, which would be politically incorrect and an ideological blunder. Dr. Lozanne was holding a sign that said “Kids deserve a future”, so I asked him if he thought ALL kids deserve a future, include unborn children. He said that wasn’t relevant to the discussion. To an ideologue, it’s irrelevant, but to a moral, scientifically minded person, it is 100% relevant. You see, science has confirmed life begins at conception, so if you are against protecting a human, just because they are developing inside rather than outside their mother, then you are anti-science. I was able to show Dr. Lozanne that his lack of desire to care for all kids was anti-science, at which point he was not able to give me a reasonable answer and made up a reason to excuse himself from the discussion. I also talked to anti-creationist Zack Kopplin, who, like Dr. Lozanne, is a nice person. Zack is a history major from Rice University, which does seem appropriate considering the creation/evolution battle is primarily about interpreting history. Anyways, I tried to get his thoughts on teaching the fundamentals of epigenetics. I told him I was teaching it to my students, and that our company has higher standards for math and science than any state in the nation. Even so, he was not in favor of including epigenetics in the Texas textbooks. He was also unable to give me a reasonable answer and made up a reason to excuse himself. Next up was Aron Ra, the self-proclaimed “YouTube Atheist”. Unfortunately, Aron is so intolerant of those who disagree with him that he would not even shake my hand. I tried to ask him multiple times what he thought about including epigenetics in Texas biology texts, but he kept diverting the discussion to natural history, claiming that he could prove, without a time machine, common descent. When I kept pressing him to talk about scientific things instead of historic things, he was not able to give me a reasonable answer and conveniently excused himself. During public testimony, I was able to talk to a couple of ideologues, including Josh Rosenau of the so-called National Center for Science Education. Josh was “tweeting” about every person who came up to testify, and I “tweeted” back appropriate responses on several occasions. Before he went up to testify, I spoke with him, joked about our “Twitter battle”, and then asked him what he thought about my testimony and including epigenetics. A friendly young man, Josh’s response was just more of the same, claiming that epigenetics was “too hard” for high school students to learn. This is an incredibly lame excuse, because, as I mentioned earlier, you can refer to the epigenome as the “captain” and the genome (DNA) as the “ship”. A 5-year old could understand that! Josh knows I’m a creationist, and I encouraged him that he doesn’t have to oppose everything creationists say. Last up was Kathy Miller, President of the Texas Freedom Network. I also encouraged her to think harder about all of this. Kathy is not a scientist, and stated that on matters of science, she consults with her experts, nodding at Josh Rosenau of NCSE (who is actually not a scientist or a science teacher). I told her that I am a scientist, and a science teacher, and I could probably help her if she wanted a different opinion. To her credit, she did accept my gift of a copy of Mysterious Epigenome, and I encouraged her to let her children read it. I also told her she didn’t have to agree with everything in the book, but I assured her there would be many things she would agree with. So what did I learn from these exchanges? Well, there are a lot of nice people out there who reject science and reason to support their ideology. And that is a huge part of the problem, if not THE problem with the whole creation/evolution battle in America. Some people, mostly liberals, have become so blinded by their “ideaological scorekeeping”, that they think it is impossible to agree with “them” about ANYTHING. Instead of a desire to engage in “genuine intellectual exploration”, we have otherwise intelligent people engaged in rampant anti-intellectualism, denying the very science they claim to be standing up for. What can we do to release the irrational and anti-intellectual stranglehold on America? First, pray, because it is God who changes hearts, and it is God who is Author of all knowledge and reason. Second, engage others. Be salt and light. Expose their foolishness while showing genuine care for them and for others. MAKE THEM THINK. For unbelievers, it is important to realize that by rejecting God, they reject reason (Psalm 14:1), so you can’t expect to have a rational conversation with them. Don’t let that frustrate you, and don’t push too hard to “prove God” or “win” the argument. God doesn’t need us to prove that He exists, everybody knows it already (Romans 1:20). And third? Well, if you have children, homeschool them! Will Texas textbooks include fundamental topics that give students a 21st Century Science education, or will homeschoolers continue leading the way in American science and math education? Time will tell. Final textbook approval is in November.